If you’re like me, the first thing you notice about a person is their smile. That said, you know the first impression a smile can leave on someone you’ve just met. Taking care of your teeth can be hard to do though. A high-quality toothbrush that keeps your teeth sparkling, but also keeps your gums healthy can be a tricky combination to find. It seems that Phillips Sonicare has mastered this combo though. When it comes to the Phillips Sonicare 9500 vs 9700, there are many key similarities that make these two brushes ideal for a healthy smile. 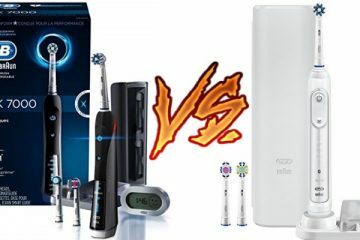 Sonicare is a great brand to go with, but how do you decide if the 9700 or 9500 is the way to go? In the table below, you’ll see the key features of both the Sonicare 9700 vs 9500. Health Benefits Overall healthier mouth; gum care, tongue care. Overall healthier mouth; gum care, tongue care. The Philips Sonicare 9700 is an electric toothbrush that uses sonic vibrations to clean teeth instead of a rotary or up and down movement. 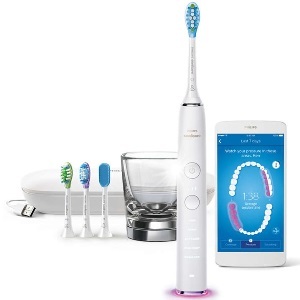 This high-tech toothbrush isn’t your average teeth cleaner. 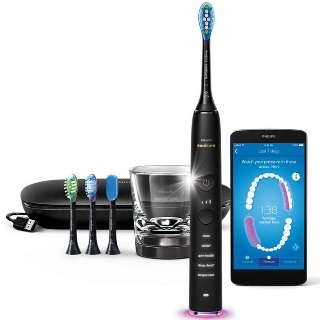 Use the mobile compatibility to pair this toothbrush with Android phones; 4.0 supported tablets via Bluetooth as well as IOS devices, including, iPad 3rd generation or higher and iPhone 4S or higher. It also will pair with iOS7 or higher. Once you’ve downloaded the special app and paired your toothbrush with your device, the app will provide coaching on the way you brush your teeth. This virtual coaching will help you achieve that healthy smile to the best of your ability. The 9700 removes up to 10 times more plaque. On top of that, it also removes stains within 3 days and improves the health of your gums within 2 weeks. It comes with 4 brush heads. The Premium Plaque Control brush head will remove 10 times more plaque than a normal toothbrush. The Premium Gum Care brush head can reduce gum inflammation up to 100% more than a manual toothbrush and give you healthier gums in just 2 weeks. The Premium White brush head will help remove 100% more stains than a normal brush in just 3 days. Finally, the TongueCare+ brush head will help keep your breath fresh. With the 9700 model, you get 2 of each kind of brush head along with a brush head holder. That is a huge advantage over the 9500. The toothbrush also charges by placing it in a unique charging glass. It will last up to 2 weeks on one single charge. It also includes a pressure sensor that will alert you if you are brushing too hard. This is something I tend to do frequently, so it has really helped out. There are also 3 intensity levels you can choose from. In many ways, the 9500 is very much alike the 9700. 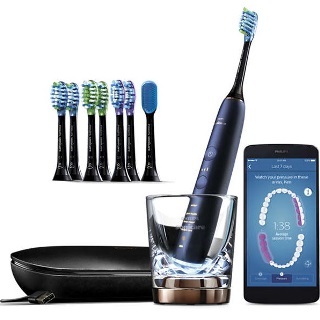 Compatible with IOS and Android devices, this Sonicare toothbrush also uses technology to help you get the best results when brushing. To access this feature, just download the app to your device and pair it with the toothbrush. It comes with 4 different smart brush head types. You can automatically pair each brush with the suitable brushing mode. After choosing a mode, the smart sensors provide real time advice. You can then make any changes if needed to customize your brushing style to your teeth and gums. Each of the 4 brush heads that the Sonicare 9500 comes with has a specific purpose. Premium Plaque Control – removes up to 10 times more plaque. Premium White – removes up to 100% more stains in just three days. TongueCare+ – Takes care of any bad breath. The brush head monitor lets you know if you’re beginning to wear your brush head out. Check the brush head monitor. The monitor tracks how efficient the brush head is based on how long you really brush and the pressure with which you brush. 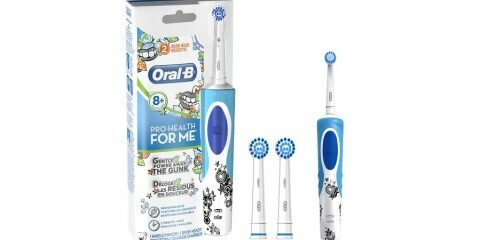 The brush head has an icon on the toothbrush handle that lights up. When the light comes on, it’s time to change the brush head. Similar results can be achieved by using the 9500. It can remove up to 10 times more plaque than manual brushes. Different from a manual toothbrush, the Sonicare 9500 uses its technology to clean your teeth with roughly 31,000 brush strokes per minute. Its sweep like motions push liquid deep into those hard to reach spaces along the gums and in your teeth, ensuring a whiter, healthier smile. Sometimes old habits may stick around. You may feel like you need to put more pressure into brushing your teeth. The Sonicare 9500 knows if you are brushing too hard. If the light ring on the bottom of the handle flashes, it’s time to let off the pressure. The brush has sensors that tell it how powerfully to brush. Both the Sonicare 9500 and Sonicare 9700, have the option to brush with 5 different modes; Clean, White+, Deep Clean+, Gum Health and Tongue Care. Each mode allows you to meet a specific need when it comes to the health of your mouth. Clean is great for everyday use. White+ comes in handy when you need to reduce stains. Deep Clean refreshes your teeth, leaving them brighter and healthier than ever. Gum Health gently cleans your gums, and Tongue Care leaves your tongue feeling clean and your breath smelling good. Whether you choose the 9700 or the 9500, you will be doing your mouth a favor. Both brushes remove up to 10 times more plaque and stains within just a few days. My teeth are not only whiter, but my gums feel much better since using the Sonicare toothbrush. The sensors inside of both brushes let me know if I am brushing too hard, preventing me from damaging my gums. There are 5 brush modes to choose from, but once I select my mode, I also choose my intensity. I have very sensitive teeth, so this feature is a nice addition to have to help prevent me from brushing too hard. You can choose from a low setting for sensitive gums and teeth, a medium setting and a high setting for extreme cleans. The advanced technology of the Sonicare brushes does a much better job at cleaning your teeth and gums. The great thing about this brush is that the technology is compatible with both IOS and Android devices. It’s simple to use and is great to have if you’re unsure of which mode you should be using when brushing. After downloading the app, all you have to do is pair your device with the toothbrush. You’ll have your own virtual coaching to help guide you on what mode to use. The first time I used the brush, I wasn’t certain what mode to use on my teeth. Within minutes, my device was paired, and the app was able to assist me in picking out the White+ mode for that day. To charge your Sonicare brush, whether a 9500 or a 9700, simply place the brush in the glass charger that is provided. This glass has a luxurious look and doubles as a rinsing cup. I enjoy the sleek look the glass has. It’s nice being able to have a charger that blends in well with my décor, rather than a box like, charger or one with a lot of cords attached. A simple travel case may not seem like much, but for the Sonicare 9500 and 9700, this case is a feature in itself. The deluxe travel case doubles as a charger, too. This case is perfect for traveling. After letting the toothbrush fully charge inside the case, you can use the brush for up to two weeks of daily use. This is great to have when you go on 1 – 2-week long vacations. The Sonicare 9700 has 8 separate brush heads. The Sonicare 9500 only comes with 4. If you don’t mind having only a couple extra, then the 9500 is a great brush to choose. If you like to have options, then the Sonicare 9500 may be best for you. You can choose from 4 different colors of brush; white, pink, grey or black. I personally don’t mind that my 9700 comes in only one color. The lunar blue that it comes in is a nice neutral color to have. Your teeth deserve to be treated with care. Not all mouths are alike, some gums are more sensitive than others and some teeth tougher than others. It’s important to find a brush that can help you have a pretty, but healthy smile, painlessly. Being able to know if you are brushing too hard, or if you should be using a different style of brushing can be detrimental to your mouth’s healthy. The clear winner is the Sonicare 9700. It comes with 8 brush heads as well as a brush head holder. The pressure sensor is also one of my favorite features. I am able to enjoy the refreshed feel of a pearly white, healthy smile with the Sonicare 9700. 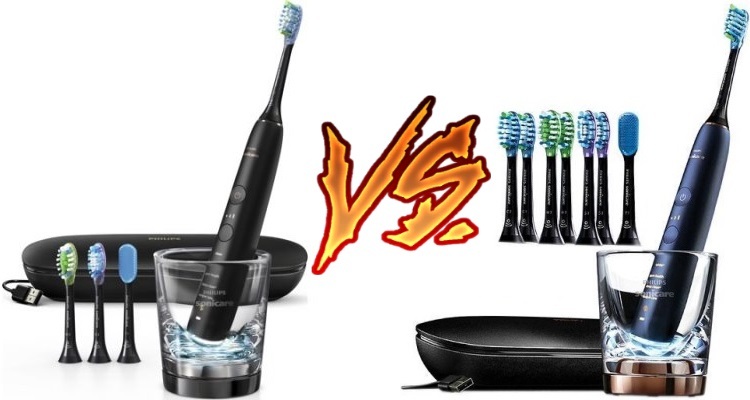 Philips Sonicare 2 Series vs 3 Series : Comparison Review! 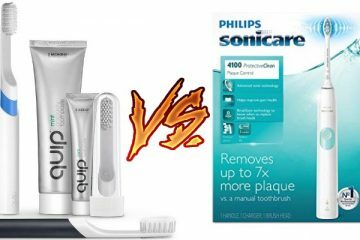 Phillips Sonicare ProtectiveClean 4100 vs 5100 vs 6100 Electric Toothbrush – Which Is Right for You? Quip vs Sonicare: Will This Newcomer Beat the Giant? Oral-B 7000 vs 7500: Which One Performs Better?